Happy to have an appreciative audience, Wayne, the docent, continued to offer anecdotes, stories, insights, and interesting bits of information. Here are a few items that I jotted down. In 1890, popcorn wasn’t really being grown commercially. It was grown in gardens, for family use. Raising popcorn was often a young boy’s first job on the farm. The boy raising the popcorn might sell some of it to neighbors, but there were no popcorn companies. 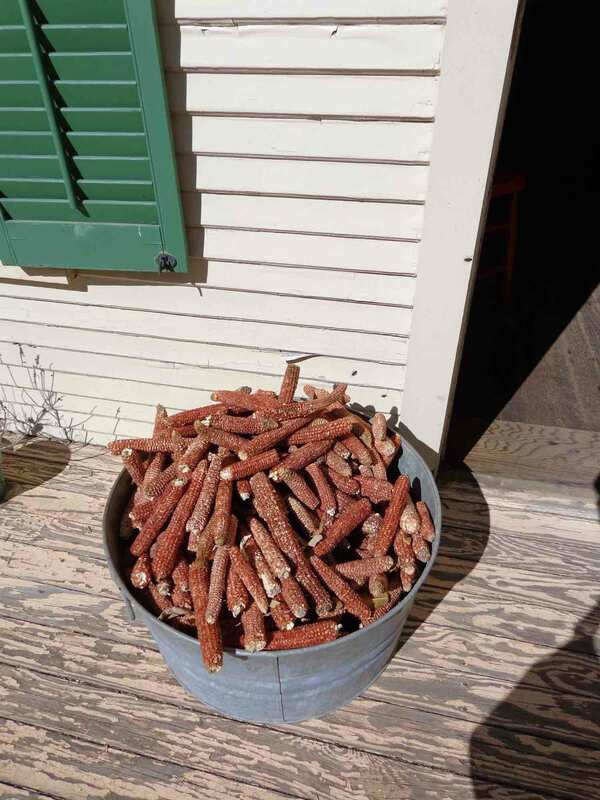 Corncobs where ideal for getting the fire started in the wood-burning stove. Women often wrote of their miserable lives on the frontier. Farming could bring prosperity, but it was a hard life. 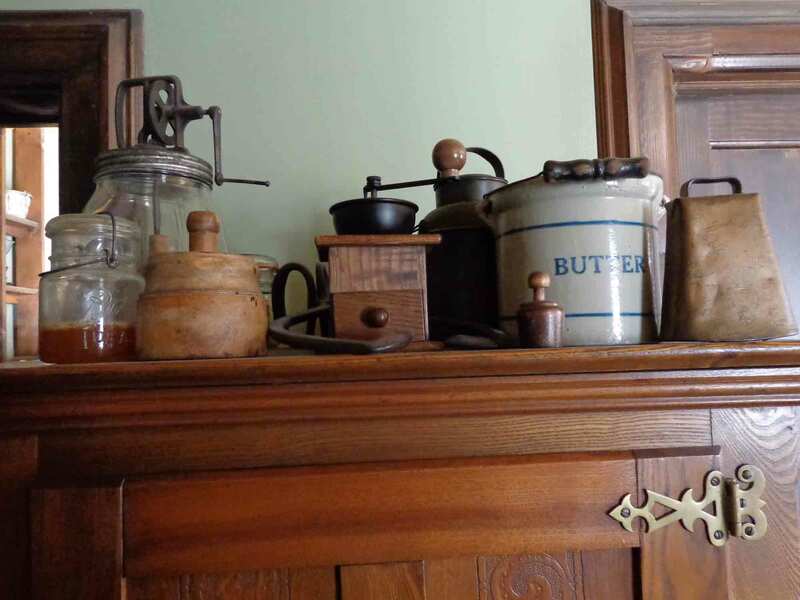 As towns began to grow, creameries would start up that would collect milk or cream—but butter was the best moneymaker. Women became known for the quality of their butter. They molds to identify the maker of the butter. I visited the barn and all the work sheds and out buildings, but I spent the most time in the old farmhouse. Here, a delightfully entertaining docent (Wayne, a former forest ranger) regaled me with stories of life on an 1890 farm. 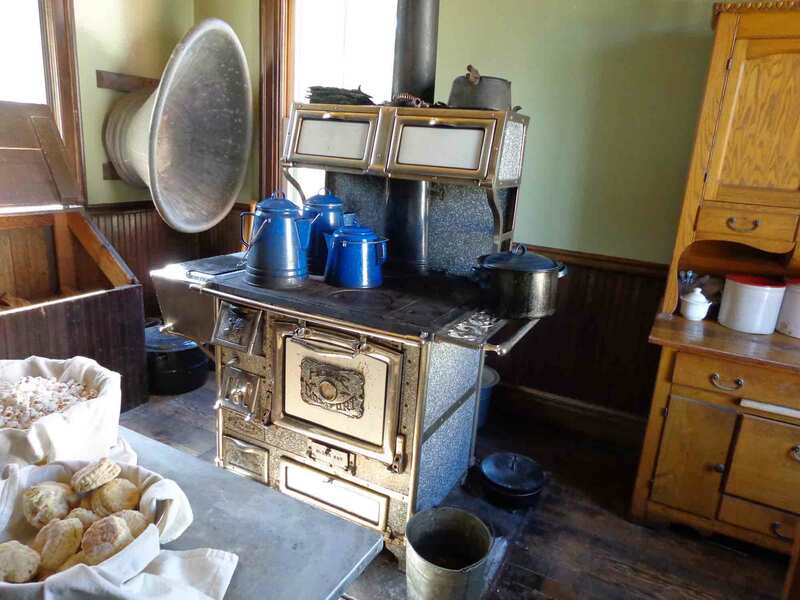 By 1890, kitchens were fairly modern, at least compared to 50 years earlier. Stoves (vs. open fire places) were available, and iceboxes offered at least some ability to keep things cool and preserved. A pump at the sink brought in rainwater from a cistern, so no hauling water from a well. In the first photo, you can see not only the “new” wood-burning stove, but also, on the wall nearby, the bathtub. Kitchens would be the only rooms with running water and, during the winter, the only ones that were warm. In the second photo, some kitchen essentials, including a butter tub and coffee grinder (in a style still available) sit atop the icebox. Popcorn might be served with cream and sugar for breakfast. Wayne assured me that this was an awesome way to consume popcorn. He also related that popped corn was sometimes crushed with a rolling pin, with the white flakes being picked out and mixed with homemade marshmallow, in what would have been roughly the equivalent of Rice Krispie Treats. The big meals were taken in the dining room. In the winter, families that had servants might have the servants stand in the dining room, to add a bit more body heat. Not everything was done by hand at this point. A machine had been devised that could cut the stalks near the base and bind them into clusters. 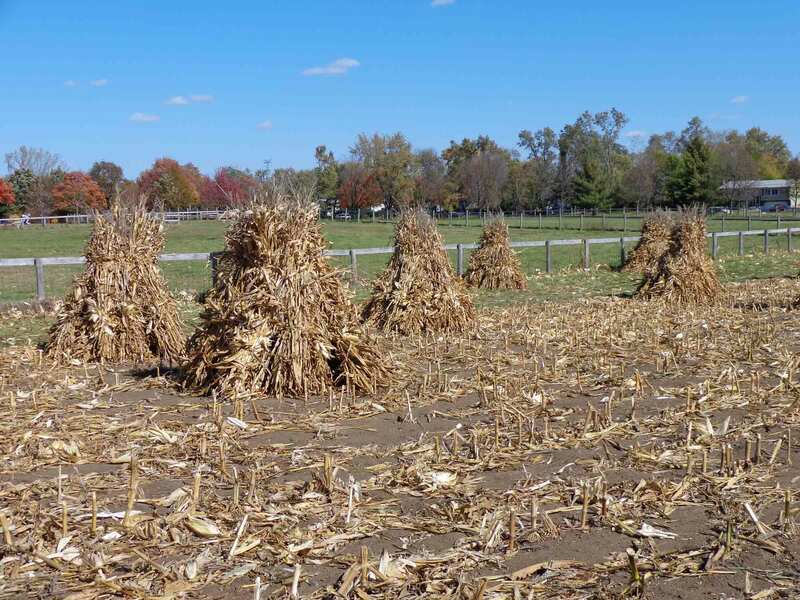 These clusters of stalks could then be picked up and piled into corn shocks—those golden hills of corn that are so evocative of the harvest season. 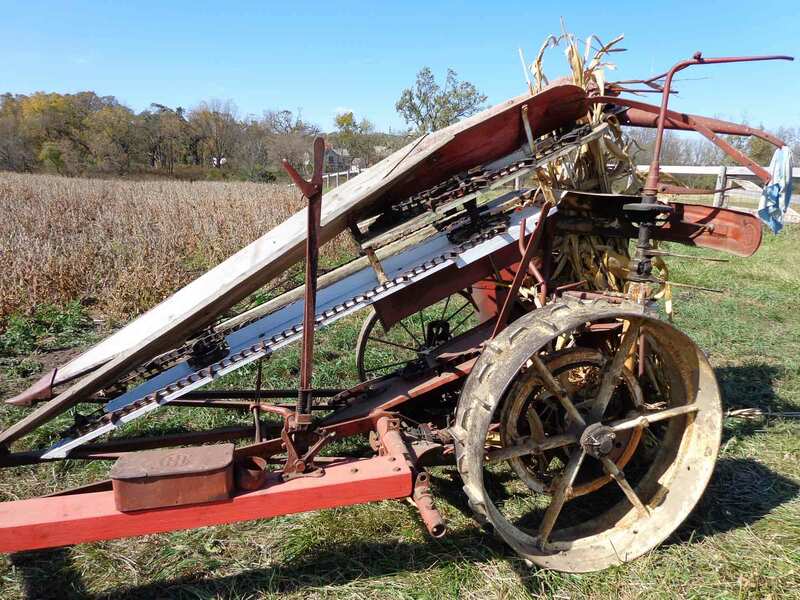 However, though shock binders, as the machines were called, would help with the work, it wouldn’t be until the 20th century was more than half spent that real changes to harvesting corn would come into use. 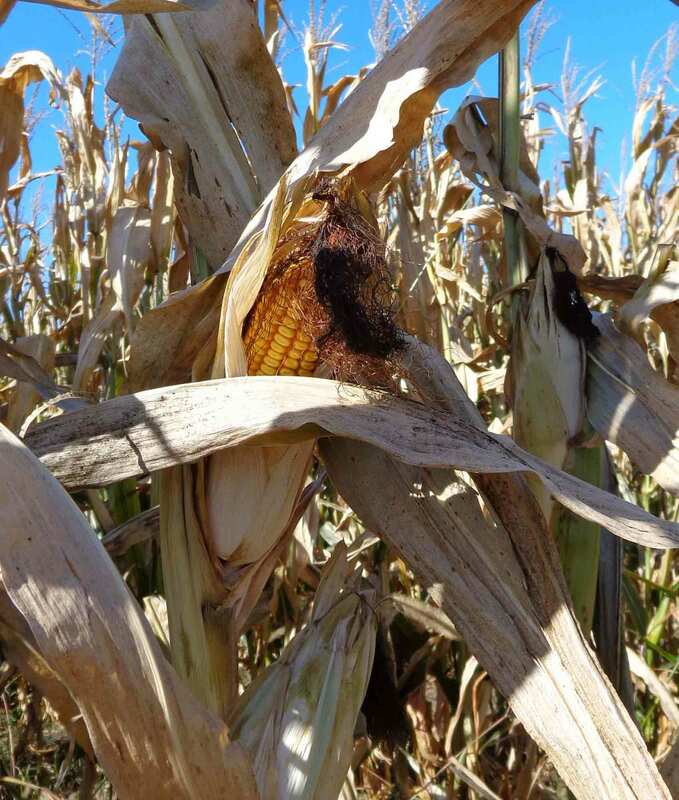 So the teepee-shaped corn shocks would be around for a while. 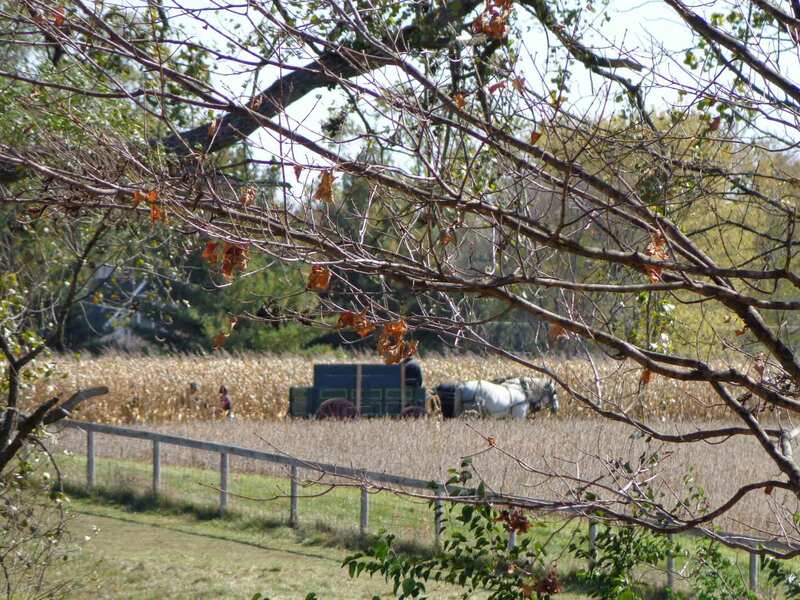 On a sunny, fall day, I headed to Kline Creek Farm in West Chicago. This is a restored farmstead that dates to the 1890s, and like many such places, is populated with splendidly well-informed, historically costumed interpreters who can introduce you to the period. Though I was looking forward to exploring the entire location, I had picked the time of my visit to coincide with the Corn Harvest. Before we would be allowed into the fields, to pluck the golden cobs from their stalks, we were treated to “Corn College,” a brief lecture on how farming in the 1890s compared to present day. In the 1890s, farmers planted 8,000 to 10,000 seeds per acre, and hoped for a harvest of 25 to 30 bushels of corn per acre. In the 1930s, hybrids were introduced. At first, in the rush to make things bigger and better, corn was bred that was too tall, with ears that were too big, so stalks fell over. But they eventually got it right. Today, farmers plant as much as 36,000 seeds per acre, and look for yields of 200 bushels of corn per acre. 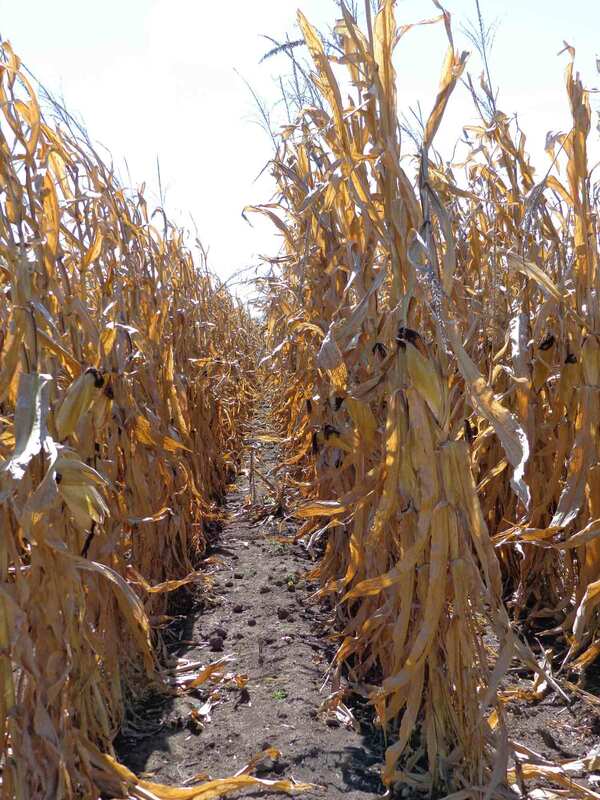 Not only does each plant produce more corn than the older varieties, but plants have also been bred to tolerate being closer together, so more can be grown. But the old-style fields at Kline Creek, with their wide rows, were handsome and sunny, and I stopped to photograph them as we walked into the fields to harvest the corn. We harvested by hand, as was done well into the 1900s. Snap the ear off the stalk, pull off the husk, and toss the corn into the horse-drawn wagon that kept pace with our progress across the field. We only harvested a couple of rows. Had to leave some for the visitors who would come throughout the week.